Project For Empty Space [at] Gateway Project Spaces is pleased to partner with Shared_Studios and Military Park to present Portals, a Global Public Art Initiative conceived by artist Amar Bakshi, which will take place for two months beginning April 16th, 2016. Portals Newark will be open to the public beginning April 18 at 9AM. Individuals can reserve 20-minute slots of time by visiting www.SharedStudios.com/Newark. Walk-ins are also welcome. Portals are gold re-purposed shipping containers that are equipped with audio-visual technology. The purpose of the project is to connect people globally to create dialogues and interactions that may not otherwise happen in the course of everyday life. Entering a portal is an experience unlike any other; upon entering the container, a participant is connected by life-size video and audio with another participant in an identical gold shipping container somewhere else on Earth. These individuals, who are more often than not complete strangers, are able to dialogue and connect in real time despite their geographical distances. The Newark Portal project will address issues within the United States criminal justice system, as part of an ongoing research series. The Portal will connect to a site in Milwaukee, WI, which has the highest incarceration rate in America, and focus its conversations on this topic. In addition to that component, the Newark Portal also will connect to the broader Portals network to allow participants to interact with people internationally. 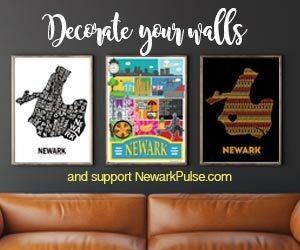 Newark will be connected to sites in areas such as Afghanistan, Cuba, Honduras, Iraq, Iran, Kenya, Jordan, Rwanda, and Zimbabwe. Since its launch in December 2014, Portals has connected more than 12,000 people in conversation between Tehran, Havana, Herat, New York, New Haven, San Francisco, Miami, Washington D.C., a Syrian refugee camp, and Kigali, to name a few. Prior participants include U.S. Ambassador to the UN, Samantha Power; journalists CNN's Fareed Zakaria and FOX's Chris Wallace; film directors Doug Liman and Morgan Spurlock; artists Mary Ellen Carroll and Titus Kaphar; and many more. Global media has covered Portals including the New York Times, the Washington Post, ABC, FOX,PBS, and NPR. Project For Empty Space and Shared_Studio is pleased to announce our Portals Newark curators, Divad L. Sanders, Fayemi Shakur and Randy Hayes Harris. Each curator will their own unique perspective to programming the Portal. Born and raised in Newark, NJ, Divad Sanders is a Criminal Justice advocate and activist. He received his BA in Psychology from Kean University, and holds a certificate in Ethical Leadership and Non Profit management from Rutgers Business School, and is an alumni of the esteemed Arts High School in Downtown Newark. Additionally, he holds a Certificate in Core Leadership from the Newark Do Something Foundation. Mr. Sanders has worked with numerous organizations related to social justice advocacy; such as, Newark Fighting Back, NJ State Juvenile Auto Theft Prevention Program, Juvenile Justice Commission, and Newark Do Something. Sanders has pioneered a movement, that empowered youth through literary arts, theater, poetry and spoken word. Fayemi Shakur is a writer, cultural worker and certified yoga instructor based in Newark, NJ. Her writing has been featured in The New York Times, The International Review of African American Art, Nueva Luz Photographic Journal, Ebony.com, and HYCIDE Magazine. For the past 15 years her creative social practice has included journalism, poetry, art, music, public programming, activism, and community service. Randy Hayes Harris is a self taught musician born and raised in Newark, NJ. He is a guitarist, leading voice and song writer who plays and produces a variety of rock, jazz and funk. Harris is a curator of musical programs, and has worked with many performing local, national and international artists at multiple venues throughout the country. Harris is the founder of the Randy Haze Trio (based in Newark, NJ), and tours nationally with hip hop sensation Justina Valentine among other artists. Harris, in his many years of playing and touring nationally and internationally, is a staple in the New Jersey/New York music scene.